The following appeared in the Sangre de Cristo Sentinel on July 19, 2014. 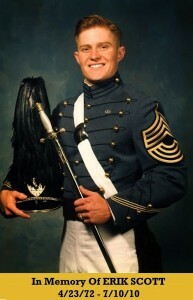 On July 10, 2010, Erik B. Scott, a 1994 U.S. Military Academy at West Point graduate with an MBA from Duke University, was shot to death by three Las Vegas Metropolitan Police Department (“Metro”) officers in front of a Las Vegas, NV, Costco big-box store. While many readers will recall that egregious, senseless murder, few know what followed: A jaw-dropping cover-up more typical of the old Soviet Union than America. To every man and woman, who carries a firearm, the Erik Scott shooting is a chilling reminder that billion-dollar companies, such as Costco, have irrational, secret, anti-gun policies that literally kill their customers. Erik, a Boston Scientific cardiac pacemaker sales rep, was carrying a legally registered concealed firearm, while he and his girlfriend were shopping at Costco-Summerlin in Las Vegas. He also had a concealed-carry permit in his wallet, issued by the same Metro police force that killed him. When Erik squatted on the floor to verify that three metal water bottles would fit into a soft-sided, zip-up cooler, a Costco employee spotted Erik’s Kimber Ultra Carry .45-caliber semiautomatic in an inside-the-waistband holster. A civil interchange with a Costco manager ensued, and Erik was told that a Costco policy banned guns inside company stores—although there were no signs to that effect posted outside or inside, and there’s no mention of a gun-ban policy in the membership application. Erik calmly responded that his sidearm was legal and that he had a concealed-carry weapon (CCW) permit on his person. The manager never asked Erik to leave the store, and the two parted on good terms, according to witnesses. The Costco manager reassured a plainclothes security guard, Shai Lierley, that Erik would be leaving soon. For reasons known only to him, the young, cocky Lierley—defying management practices and company policy—placed a 311 call to the local police, falsely claiming Erik “had a gun and was acting erratic.” Thinking an armed madman was barricaded inside, Metro cops rushed to the store in overwhelming force—15 police cruisers, a helicopter, an incident-command team and an ambulance. An inbound Metro lieutenant suggested that Costco managers quietly evacuate the store. Unaware that the evacuation had anything to do with him, Erik and his girlfriend calmly walked out with the crowd, passing three Metro officers waiting at the entrance and exit doors. Costco’s Shai Lierley identified Erik to an agitated, scared Metro officer, William Mosher, who was clutching a semiautomatic, visibly shaking and sweating profusely. Alarmed, Mosher spun around and immediately yelled something, which even nearby cops failed to comprehend. Erik turned to find a frightened, obese cop shouting three conflicting commands. With his left hand, Erik lifted his T-shirt to expose the Kimber, and repeated, “I am armed, I am armed…” Witnesses said he moved his right elbow enough to expose the Kimber. In his right hand, Erik held a BlackBerry cell phone. Mosher instantly panicked and fired two shots with a .45-caliber Glock 21. The cop’s first hollow-point slug struck Erik in the heart; the second went through his right thigh, well below his jeans’ front pocket. Two other officers hesitated a long beat, then fired another five rounds, all into Erik’s back. Erik was shot a total of seven times. The five that hit him in the back were fired after he was on the ground, dying. Based on a recording of Lierley’s 311-call, we’ve confirmed that Mosher gave Erik three conflicting commands and fired, all within two seconds. Mosher then knelt on his victim’s back and handcuffed Erik’s hands. Costco had numerous security cameras inside the store and at least four trained on the entrance, where the lethal shooting took place. Violating department policies, Metro detectives did NOT immediately seize the surveillance system’s two digital video recorders’ hard disks. They left the critical DVR and hard drive in Costco’s control for five days, allowing Costco-Summerlin personnel and the store’s IT contractor to tamper with video data. Five days after the shooting, Metro detectives finally decided to pick up one Costco DVR. After valiant attempts to “recover” critical imagery, the DVR was sent to the U.S. Secret Service’s Los Angeles office, where forensics experts examined it. The experts later testified that 96 percent of the DVR’s data were recovered. The four percent not recoverable just happened to encompass the time Erik was in Costco, as well as the fatal officer-involved shooting. The hard disk’s platter sectors, where that critical four percent of unrecoverable data resided, was physically damaged, as if the disk were running, “then dropped from about chest high,” according to forensic experts’ testimony. Within hours of the shooting, a Clark County Deputy Public Administrator and a Metro cop illegally broke into Erik’s condominium and stole several of his firearms. One pistol, a small Ruger LCP, was later produced as “proof” that Erik was carrying two guns. Why two? Because the AMR ambulance crew had reported finding a gun on Erik’s body. The sole gun Erik really was carrying (the Kimber) had already been removed from the corpse and placed on the ground at Costco, still in the holster, as if Erik had pulled it, thereby “justifying” Mosher’s murder. In fact, the only item Erik ever had in-hand was his BlackBerry smartphone. In a state of panic, Mosher couldn’t distinguish a BlackBerry from a semiautomatic pistol. He literally executed Erik. There is absolutely no doubt that Erik was murdered. However, integrity-challenged cops of Metro’s “Blue Wall” immediately resorted to post-shooting procedures that are standard practice for hundreds of corrupt Las Vegas police officers: Conceal the facts, destroy and manufacture “evidence,” coerce selected eyewitnesses, and systematically demonize the deceased victim. The cover-up of Erik’s murder-by-cop was aided and abetted by the Clark County District Attorney, an unprincipled union—the Las Vegas Police Protective Association—and wealthy power brokers, who control The Strip. The truth about Erik’s murder and its blatant cover-up is so bizarre that non-Las Vegas citizens would never believe it. Consequently, I resorted to asymmetric warfare. I wrote a novel based on the actual events of my son’s senseless execution. Entitled The Permit, the book is “faction”—truth wrapped in a techno-thriller story. According to reviewers, The Permit is a fast-moving, riveting tale of intrigue, corruption and accountability. 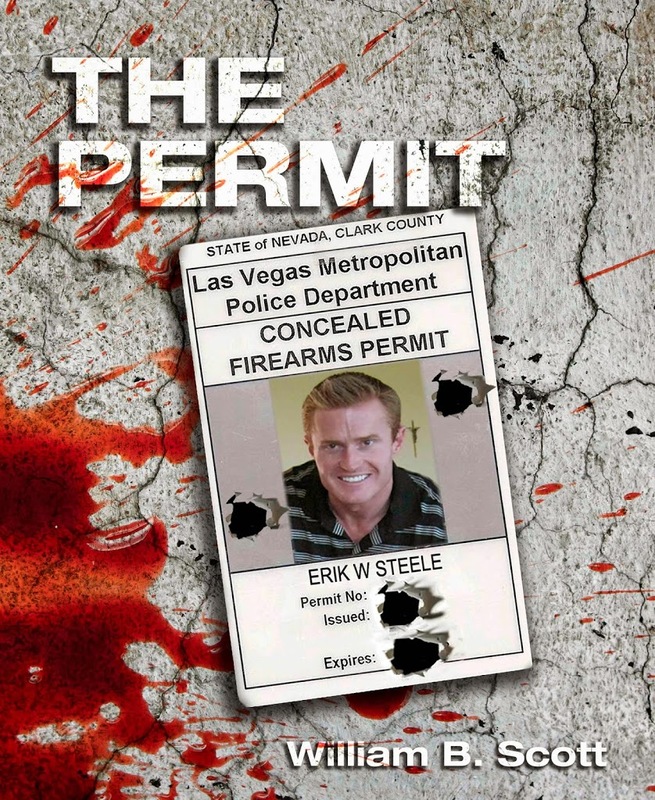 Synopsis of “The Permit:” A murder-by-cop victim, “Erik Steele,” was actually a covert assassin for Checkmate, an ultra-secret Department of Homeland Security counterterrorism team. 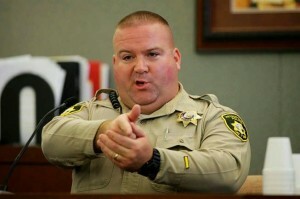 Arrogant, low-intelligence Las Vegas Metro cops had brazenly killed a high-value federal agent. As Metro leaders soon realize, their trigger-happy cretins truly did kill the wrong guy. Metro’s clumsy attempts to cover-up Erik’s execution triggers a deadly campaign codenamed Operation Gold Shield. Activated by the highest office in America, Shield is designed to neutralize INDIGO, a new, dangerous class of domestic terrorist that has killed more Americans since 9/11 than were lost on that modern day of infamy: Rogue cops and their corrupt allies. Shield is launched to prevent the U.S. from erupting in armed revolt. However, the initial targets are those responsible for killing a fellow Checkmate agent, Erik Steele. Integrity-devoid killer-cops, corrupt district attorneys, police union thugs, an unscrupulous sheriff, and even a powerful billionaire are held accountable via advanced, highly classified means, such as tiny missiles with nanoparticle warheads; a microwave-beam weapon that fries a victim; an airborne system that creates “ghosts” in a target’s bedroom; a “black world” fighter aircraft armed with T-Rex, a stunning electrostatic weapon; an acoustic beam that shatters bones and buildings, and a lethal disease that precludes sleep. Ultimately, bodies pile up, government officials run scared and the glitzy Las Vegas Strip is silenced. During a nine-year Air Force career, Bill served as aircrew on classified airborne-sampling missions, collecting nuclear debris by flying through radioactive clouds; an electronics engineering officer at the National Security Agency, developing satellite communications security systems; and an instrumentation and flight test engineer on U.S. Air Force fighter and transport aircraft development programs. Bill is a Flight Test Engineer graduate of the U.S. Air Force Test Pilot School and a licensed commercial pilot with instrument and multi-engine ratings. He has logged approximately 2,000 hours on 80 aircraft types, and holds a Bachelor of Science degree in Electrical Engineering from California State University-Sacramento.